Border Cheviot sheep originated as a mountain breed, native to the Cheviot Hills between Scotland and England, where the climate is harsh and the conditions are rugged. 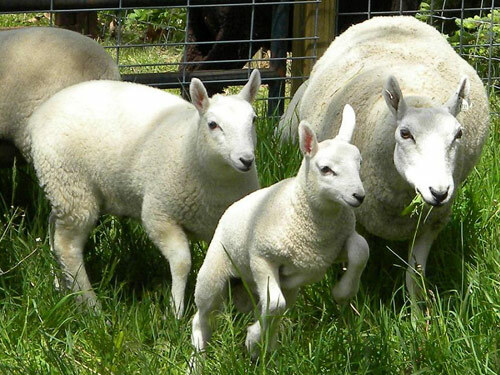 Cheviots are extremely hardy and can withstand harsh winters and graze well over hilly pastures. They were bred to look after themselves. Recognized as early as 1372, the breed is reported to have developed from sheep that swam ashore from shipwrecked Spanish ships that fled northward after the defeat of the Armada. Cheviot sheep are a distinctive white-faced sheep, with a wool-free face and legs, pricked ears, black muzzle and black feet. They are a very alert, active sheep, with a stylish, lively carriage. Cheviot wool has a distinctive helical crimp, which gives them a highly desirable resilience.